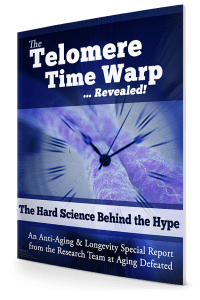 Thank you for signing up to receive the special report, The Telomere Time Warp … Revealed! The Hard Science Behind The Hype. Your free report is on its way to your inbox, along with a short note to welcome you to our community. My name is Lee Euler and I’m the founder of Awakening from Alzheimer’s, as well as the world’s leading publisher of information on alternative cancer treatments, Cancer Defeated. I’m also the founder of Aging Defeated, the web’s premier authority on the latest anti-aging and longevity breakthroughs. By requesting this eye-opening report, you’ve taken the first step in gaining control of your health to greatly expand the number of good, healthy, and productive years you have ahead of you. Your timing couldn’t be better, by the way. Because we’re on the verge of some incredible breakthroughs that are changing the way we approach aging on a cellular and genetic level. These discoveries are moving the needle on aging in ways that we could only dream of until now. And I can’t wait to share them with you! As way of saying ‘thank you’ for signing up for our special report, you will receive a free subscription to our groundbreaking weekly e-newsletter, Aging Defeated. Aging Defeated reveals safe, proven solutions for aging and longevity – PLUS new cutting edge anti-aging breakthroughs that may be available soon. You’ll learn about tips, trends and therapies you can use now to roll back the years, and obscure, yet powerful, “fountain of youth” secrets from around the world. Our mission is to not only share these discoveries with you, but help you extend your “good” years for decades. This means not only living longer, but enjoying the benefits of a better, healthier life far beyond your expectations. I’m excited to have you join me on this journey to optimal health and longevity! PS: Know someone that may be interested in a longer, healthier and better life? Share the good health! Just click on the button below to share this free report with your friends and family.